I'm pretty sure this guy has malaria. 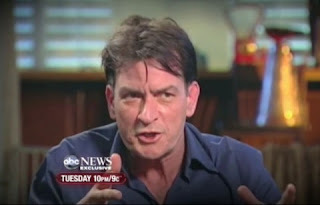 Hoping to get a new Bachelor post up in the next day or nine, but first a quick word on this Charlie Sheen fella. I mean, an exclusive interview on 20/20 to clear the air?! There's no way this goes well. Shouldn't he be going on Intervention? Or at least Diners Drive-Ins and Dives? I imagine a cheeseburger / cocaine combo to be unstoppable. This guy HAS TO BE the next Bachelor. Regarding The Bach, I was very excited to see ALL THREE of the remaining bachelorettes wearing Daisy Dukes in South Africa. It's a shame they now all have malaria. I mean, if you're a mosquito and you're living in South Africa, that had to be the best week of your life, right? I bet there's a mosquito there right now bragging to his buddies about how awesome his week was. I'm seriously jealous of those mosquitoes. This is truly a new low-point in my life.